The month's shopping started off slowly. I held out until the 10th October before making a purchase, when I found a skirt suit online at Secondhandrose (£18ish). I like the bright, floral skirt suits that have been popping up by designers such as Gucci, and filtering down to brands like Traffic People. I was pleased to find this vintage one. 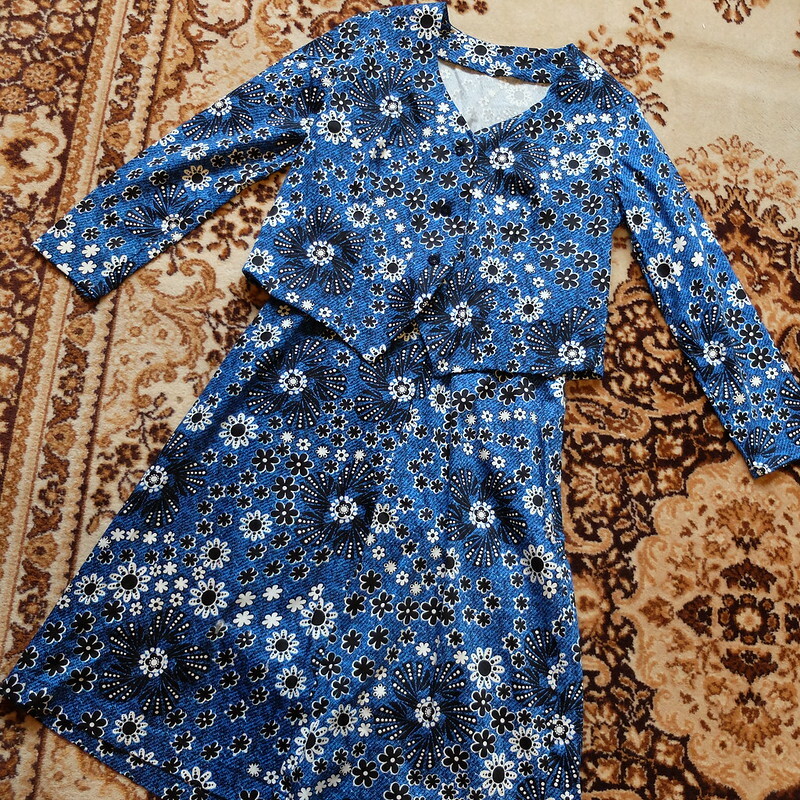 It's more of a summer weight one but that gives me time to do some alterations to it, as I want a shorter skirt and a more cropped jacket length. I had a PhD deadline towards the end of October, so that perhaps explains why I spent so little time shopping. I was hunkered down over my keyboard instead. My finger hovered over the 'buy now' button on the M&S website a few times. I find it tempting when they have 20% off. In the end I talked myself out of any purchases and saved my money for a few vintage pieces on our trip to West Wales. Well, you have to have souvenirs don't you? 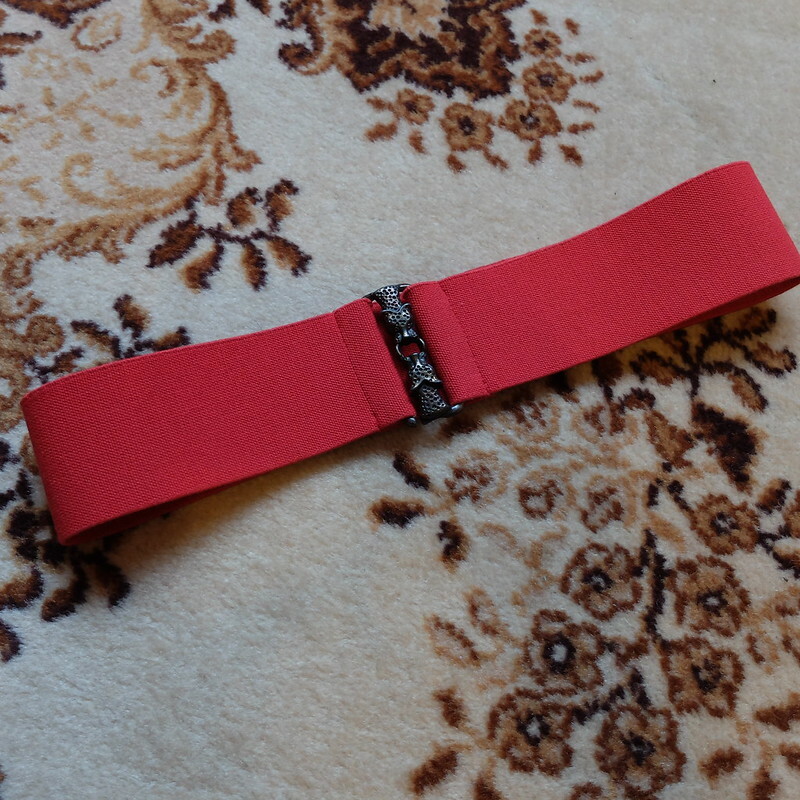 First purchase on our trip was a red elasticated waist belt, £5, with some kind of big cat clasp. Bought from an antiques shop in Newcastle Emlyn. In the same place, my husband forced me to buy a 1940s riding jacket (see me modelling it in this post), for just £10 off the sale rail. The lining has lots of tide marks, which put me off initially. But after confirmation that the jacket has no odours, and is excellent condition outside, I decided to take the risk. I've since steam-cleaned the whole jacket, and tried spot cleaning some of the lining - those marks aren't going anywhere, but at least I know now it's as clean as can be. Next up, in another antiques shop, was a French quilted bed jacket, £18. 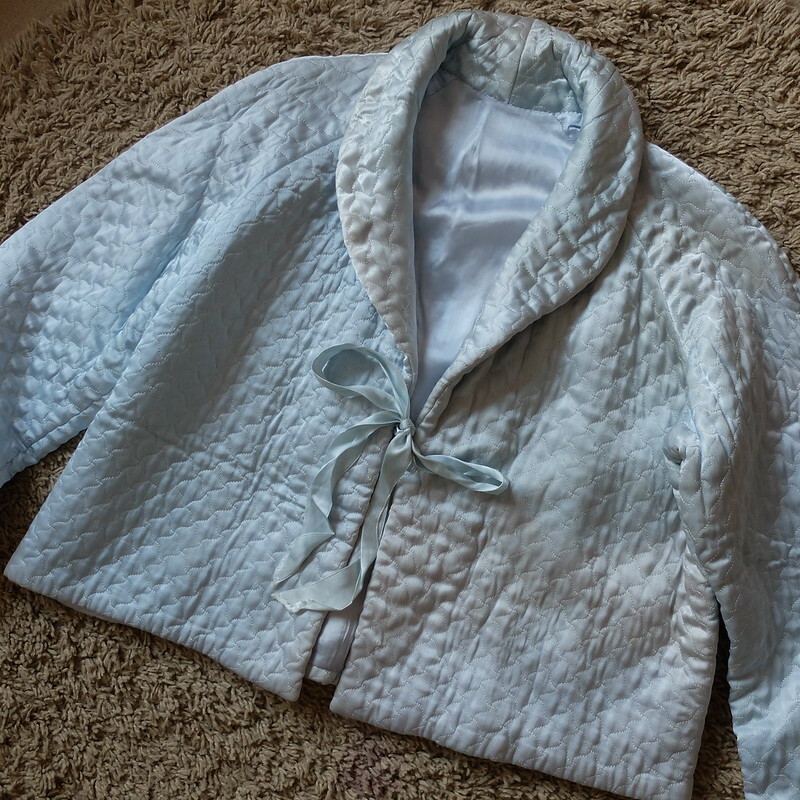 I've been after a decent bed jacket for ages, as I love to read in bed, but get cold arms. This one is nice and thick, and also glamorous. It's slightly discoloured in places, but as the only place I'm wearing it will be in bed, when the lighting's dimmed, that doesn't bother me! Finally, I bought a slinky silvery M&S skirt from a charity shop, £3.50, in Cardigan. I cannot for the life of me visualise how this will work with my exisiting wardrobe. I might have to go down the route of how I see this kind of thing being worn in Vogue, with a knitted rollneck. 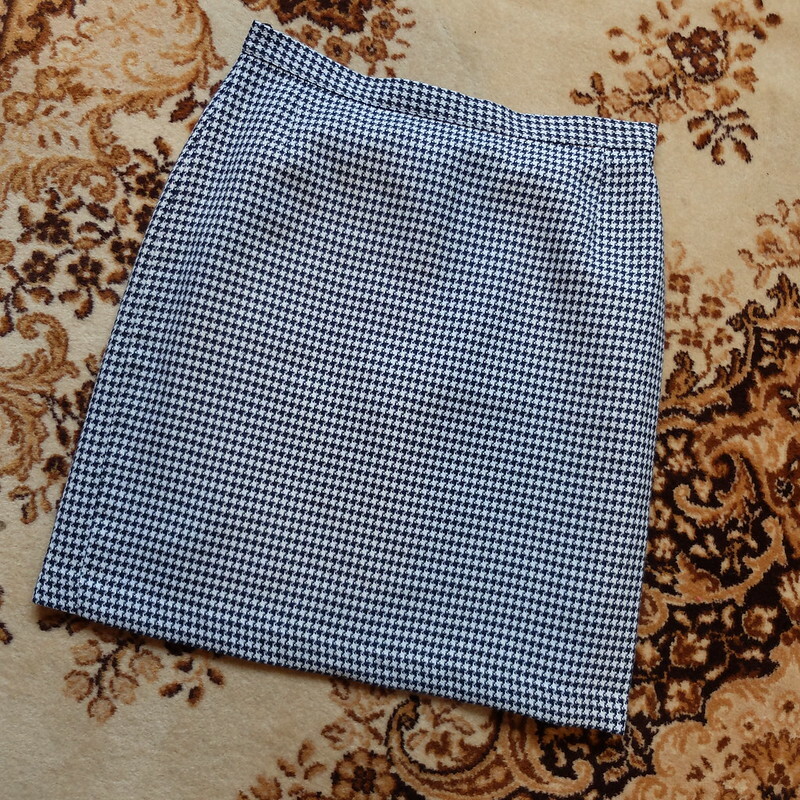 On another weekend away, this time to West Sussex, I bought a houndstooth skirt, very '60s (£10), from a sweet little vintage shop in Midhurst. I've already worn it for an outfit post here. A vintage slip (£8), from a mostly not-vintage fair in Henfield. 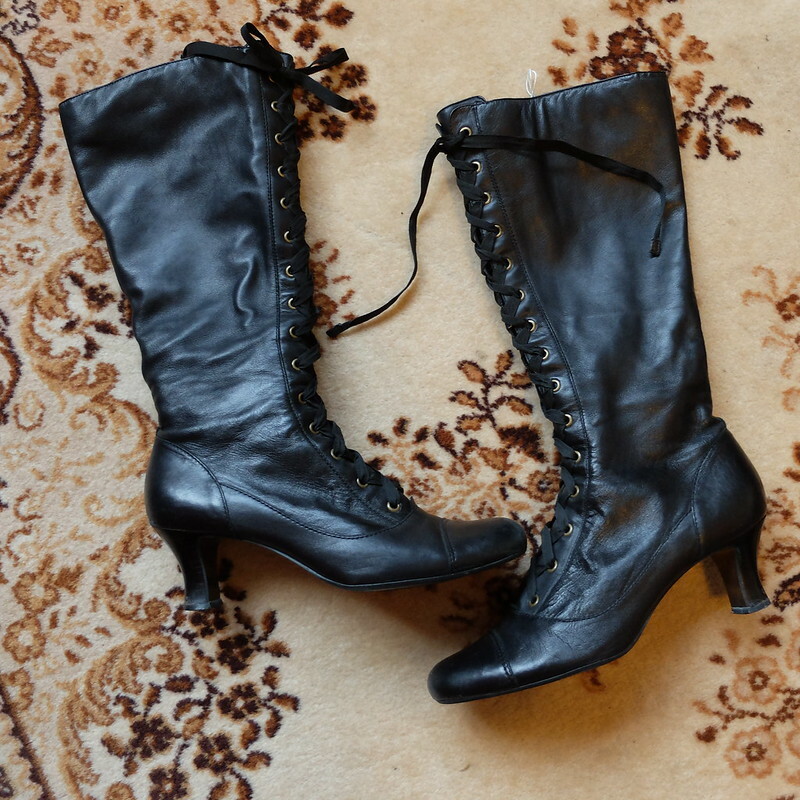 A pair of Clarks Victorian style boots (£15), from a charity shop in Henfield. 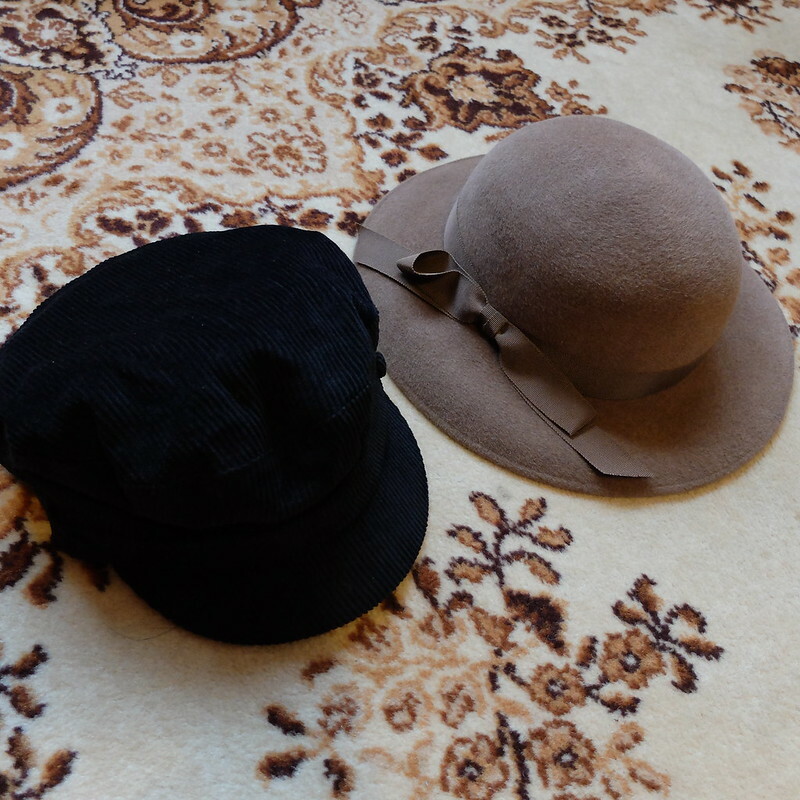 The hat on the right is the '60s/'70s one (£5.99), from Oxfam in Hove that I mentioned a terribly posh lady insisted I buy. The hat on the left is the 'Mariner' by Failsworth, in black cord, that I picked up in a Cardiff charity shop fo £2. 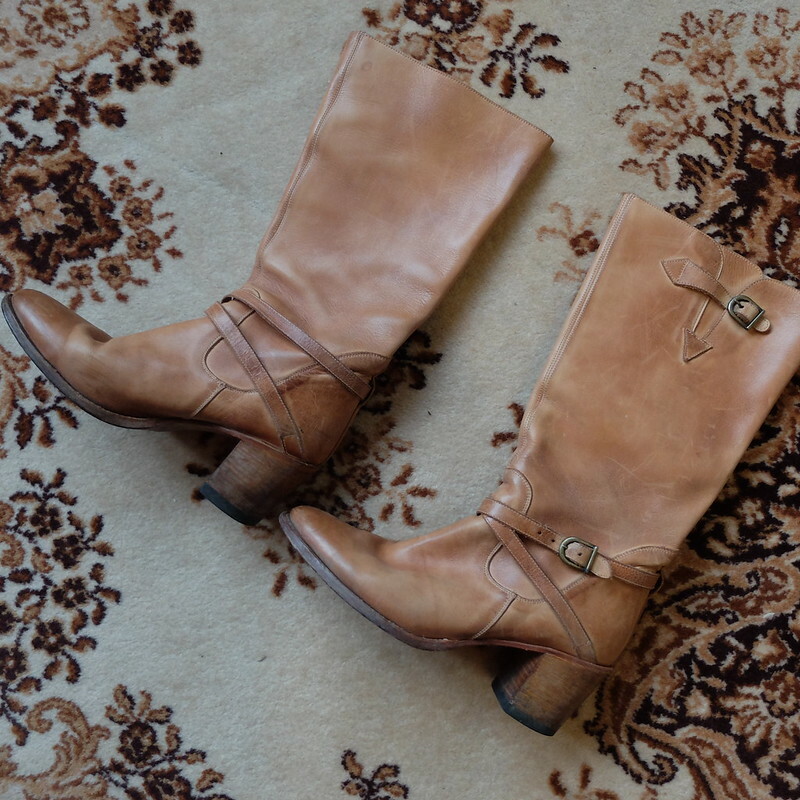 Also from that same Cardiff charity shop were these fabulous Sendra boots. Unbelievably they were just £1, when the brand is quite a posh one and boots seem to be £200 and up. Finally, there was a Boden cami top, that ended up being just £2 with the combination of a voucher and discount code. Total spend, a few quid under £100. One could easily have spent that on the hacking jacket alone, so I think that's very reasonable for everything. This month then was a 92% ethical month for purchasing - apart from the Boden cami top, everything else was secondhand, either from a charity shop, vintage shop, or antique shop. Good for the environment, good for the wallet. Thanks for this post! I abs love that belt. 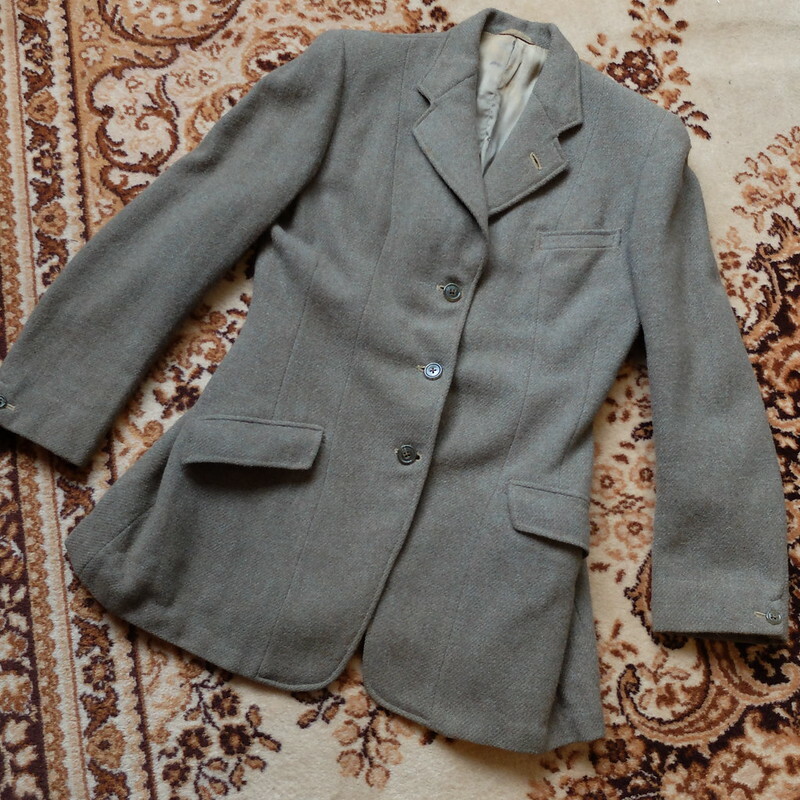 You mention steam-cleaning the riding jacket, so I was wondering if you'd ever made a post about cleaning vintage clothes? I've been really struggling with a few things in my wardrobe since you can't always wash them and dry cleaning is just too expensive here. It would be really awesome to read a post from you on cleaning and caring for vintage things. Thanks Anastasia! The queen of cleaning is Vix, over at vintagevixon.blogspot.co.uk - she has written many posts about cleaning vintage so if you search the archives you will find lots of helpful advice. I never personally dry clean anything. Good luck! If smell is a problem often spraying the item down with straight,cheap vodka will get rid of it. If it doesn't work the first time give another try. This is a nice option for things that can't be washed,even by hand. I keep on wondering how you all ,fantastic thrift shop ladies, find these magnificent pieces! What a smashing round-up this week! 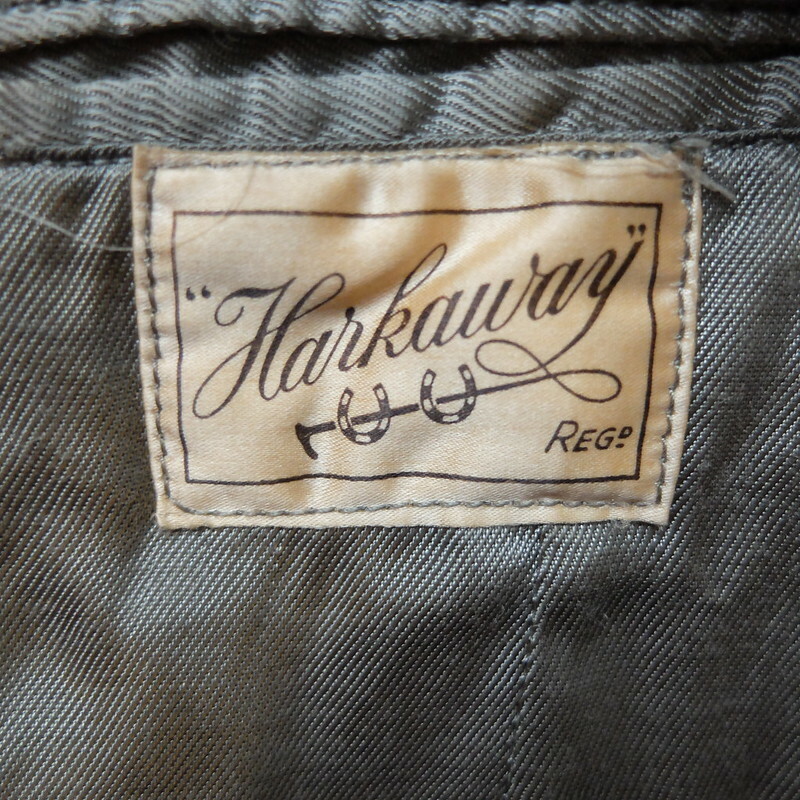 I love how good the hacking jacket looked on you on your travels and seeing its label makes me like it even more. The bed jacket, hats and the slip are fab and both pairs of boots were amazing finds. The Secondhand Rose suit is super funky. Excellent purchases, I'm very jealous of both pairs of boots! I always enjoy your shopping recap posts. You and your husband have an amazing eye for spotting marvellous garments. Oh and today I learned that sleeping jackets existed ! Looks like you had some great finds last month! Love the riding jacket, which you styled beautifully, and that silvery silk skirt. I do think it would look really nice with a slightly oversized sweater and a pair of knee high boots, actually. It might not be a very vintage way to style it, but I think it would be really cool on you. Your Clarks boots are the best find ever!!!!! They are all of my boot dreams come to life. Those black boots are an absolute dream! Also love that silver skirt!